We arrived at The Parc Hotel and was immediately taken aback. This newly renovated hotel is easily spotted whilst driving down College Point, it’s grey architectural design is very hard to miss. We checked in rather early and had to wait for our room. 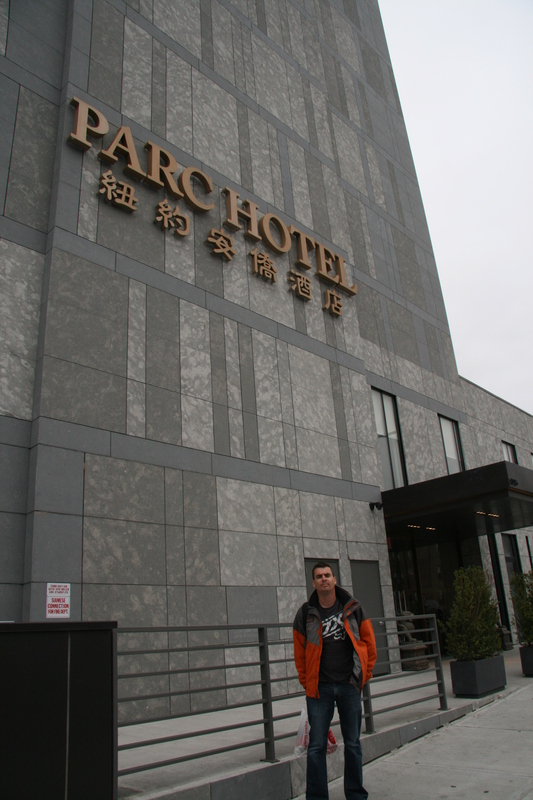 We did not mind at all because of how conveniently located The Parc Hotel is. There are tons of shops and restaurants located nearby. So don’t be afraid of checking in early if you have no choice. Just leave your bags with reception and head down 1 block to the Sky View Centre. Getting back to the hotel. The Parc Hotel has an incredibly friendly and helpful team at reception. Immediately upon checking in, we were given a map of Flushing and Manhattan. We were told how to use the Subway and were given some great New York Travel books. Our room is amazing! The design is so crisp, fresh and clean. We are in love with it! The bathroom is modern and features a shower and a tub which we love! The bed is extremely comfortable and feels as soft as clouds (assuming clouds are indeed soft and fluffy). We were so excited about the room and it’s’ view that we immediately had to Face Time our family in South Africa to show them how awesome this hotel is. The rooms have an incredible view of Flushing. It also features an iPhone docking station and a Nespresso Machine. How amazing is that? Overall, our experience has been amazing. We definitely recommend visiting The Parc Hotel during your next visit to New York. It’s extremely good value for money and the main tourist attractions are only a subway ride away. Besides, Flushing has so much to offer as well. The time has now come to rest as our jet lag has officially caught up with us! We are looking forward to breakfast at Parc Hotel tomorrow, we hear it’s Asian Inspired… nom nom!